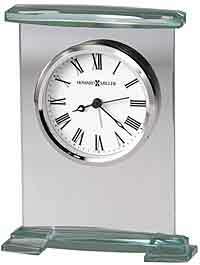 New from Howard Miller Clocks, the Brinell III is a glass arched alarm clock featuring a metal base and posts with a polished, silver-tone finish with a brushed finish on the rectangular feet and the sides of the posts. The glass panel is a full 3/8" thick! 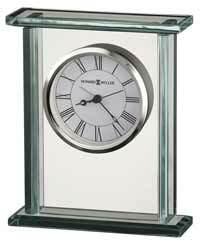 White dial with black Roman numerals, minute track, black hour and minute hands, silver second and alarm hands, and a glass crystal surrounded by a polished silver-tone bezel. Quartz, beep alarm clock movement includes one AAA battery. 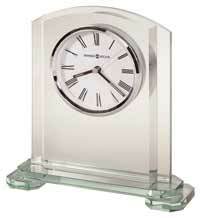 Clocks for sale at The Clock Depot including the 645-742 at discount prices.